Steve Rogers was injected with the super-soldier formula to become the US military's secret weapon in World War II. Frozen in ice following a fall into arctic waters, Cap was found years later by the Avengers. I'm never particularly enthused about Captain America figures. Outside of stuff like Secret War Captain America, they all tend to look very much alike. This is a Minimate version of the Marvel NOW! costume, so it has new molds for the gloves and mask, while the rest of the details are painted on. The sides of his chest should be grey, rather than blue, but they did a good job with the honeycomb armor and the details on his pants and boots. He has a shield we've seen before, and light blonde hair. Wanda Maximoff is the daughter of the mutant Magneto and a long-standing member of the Avengers. Her mutant power to affect probabilities is heightened by Chaos Magic, with often unpredictable results. Marvel NOW! saw Scarlet Witch's return to superheroics, as part of the Avengers Unity Squad (aka the Uncanny Avengers). Her costume is much more conservative than usual, in that she's almost wearing real clothes instead of a bathing suit: she's less confident in herself now, so she doesn't dress in as flashy a manner. She's still showing cleavage, because that's the kind of girl she is, but if you saw someone wearing this outfit on the street, you wouldn't immediately think it was cosplay. Her "skirt" (actually the lower edge of her jacket) is a new piece, and although she's still wearing her traditional M tiara, the hair is new as well. The set includes alternate hex bolt hands. 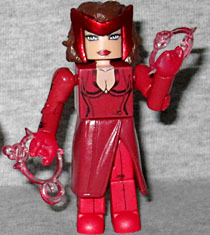 Yet again, Series 16 of the Toys Я Us Minimates was one where not all the exclusives were identified as such - but Cap and the Scarlet Witch do get the sticker. 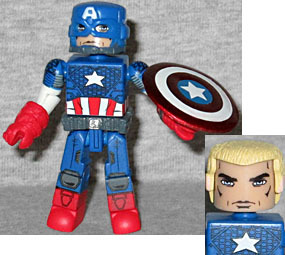 This entry was posted in Art Asylum, Marvel, MMMR and tagged Avengers, Captain America, Minimates. Bookmark the permalink.